Are you the adventurous type? Sitting on a desk for 8h every day is definitely not for everyone. Read about how the TEFL course helped Nicky achieve the quality of life she always wanted! I worked in marketing for a couple of years before realizing that I am definitely not made to work behind a computer all day and that I wanted to travel, meet new people, go on crazy adventures and find out what I really loved to do. After a short time in France, I started to teach English to some of my friends and this sparked my interest for TEFL. I have always had a special love for Spain, so it was an easy choice to pick it as the destination for my next adventure. 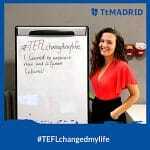 When I googled TEFL in Madrid, TtMadrid was the first option that popped up. That and Helen’s kindness in helping me with all my questions meant that I was soon off to Madrid to join the TtMadrid family and start the next chapter of my life. The sun! But mainly wanting to experience living in a different culture and meeting people from all over the world. I arrived in Madrid in January 2016 and started my TEFL right away. Since then, I have been working as an English teacher as soon as I finished the course. I started off teaching various in-company group classes, one-to-one’s and kids’ classes. My first summer in Spain I worked at a children’s summer camp and the year after, I came back as the Director of Studies. After a year, I started teaching specialized classes focusing on business skills such as giving presentations, negotiating, how to prepare for job interviews etc. My classes are always very dynamic and I make sure I include lots of games and creative activities to make learning fun. I specialize in helping people to feel more comfortable and confident speaking English. Right now, I mainly teach specialized one-to-one courses to managers, directors and partners from big multinationals such as Telefónica, Deloitte and SAP, coaching them in their personal development and using English as a tool to reach their professional goals. 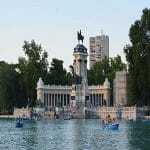 What have you discovered about yourself since you moved to Madrid? That having the freedom to spend my time the way I want to is what I value most. Having this job, I feel like I am completely in control of my schedule; I decide when I want to work, with whom, for how much money and where. I have learned that, contrary to working behind a computer every day, I am most comfortable working with people, using my knowledge and creativity on a daily basis to offer my students great value for their money. This makes me incredibly happy! What’s the most important thing you have learned since you moved? Not everything needs to be planned out in detail all the time. The Central European culture is known to be very structured, punctual and efficient in how people spend their time and having had that as a standard my whole life, it was great to see that it doesn’t always have to be like that. I really love the more laid-back mentality of Spain, where spending time with your loved ones is a priority and you really get to live more in the moment. I’ve learned to embrace that and find a good balance between the two cultures. I love how people in Spain are very spontaneous in their social plans and you can just call your friends after work to set up something to do that same night. It’s great! If you want to find out more about our TEFL courses click here or tell us your story on Facebook!